By special request and input, Maxpower has updated the Digital FingerPrint WordPress Plugin to add the ability to set the digital fingerprint to display in EVERY post, old and new. I wrote about the Digital Fingerprint WordPress Plugin a few days ago, which puts a unique searchable phrase into your feed content and displays search results on your WordPress Administration Panel to help you track if your content shows up in search engines via splogs or scrappers, content thieves. You can set this in the Digital Fingerprint Options section of the Digital Fingerprint panel. Your choices are to automatically insert your fingerprint at the start or end of a post, or at the end of the first paragraph of every post. 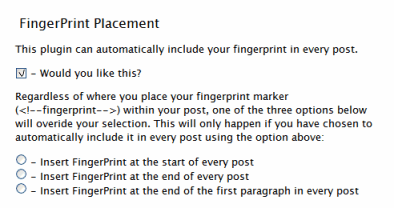 You can still use the the Fingerprint button in the Write Post panel, but the above choices will override the Fingerprint comment code if applied to all your posts. If you just want to digitally fingerprint only some posts and not all, then you can uncheck the “Would you like this?” option under FingerPrint Placement. With the AntiLeech WordPress Plugin by Owen Winkler I just wrote about, we are now fighting back against sploggers and illegal usage of our blog’s content. Oh, dear, I’m getting a little sentimental. I think it’s time to hug some WordPress Plugin authors, don’t you? Show your appreciation and spread the word. Great work, guys! This entry was written by Lorelle VanFossen and posted on October 5, 2006 at 7:02 pm and filed under blogging tips, WordPress, WordPress News, WordPress Tips with tags how to use wordpress, wordpress, wordpress help, WordPress News, WordPress Tips, wordpress tutorials. Bookmark the permalink. Follow any comments here with the RSS feed for this post. Post a comment or leave a trackback: Trackback URL. I thought that this had been fixed. Just ignore it. It won’t hurt you.